Cook macaroni according to package directions. Set aside. Place milk, flour, and onion salt in a jar. Cover tightly and shake vigorously one minute. 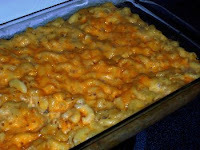 Stir together flour mixture, 3 ½ cups cheese, and macaroni. Pour macaroni mixture into lightly greased 13 x 9 inch dish. Sprinkle with breadcrumbs and remaining 1 cup cheese. Drizzle with melted butter.